Herma’s Fine Foods & Gifts » Herma’s News – Turning Winter Blues into Winter-time Fun! I refuse to accept the view that mankind is so tragically bound to the starless midnight of racism and war, that the bright daybreak of peace and brotherhood can never become a reality… I believe that unarmed truth and unconditional love will have the final word. – Martin Luther King, Jr. Here we are cozily nestled in our places of warmth trying to stay out of the cold. And while home is where the heart is, one can’t stay forever holed up in hibernation. If you are looking for a place to inspire, where you may find a unique atmosphere and a friendly smile, be sure to stop by Herma’s. While there, you may want to treat yourself by stocking up on all kinds of special foods and luxury items that will help you get through the bitterly cold days of January. One way to make winter more enjoyable is to pamper yourself with special body care products that help keep your body hydrated. Be sure to set the stage with fragrant candles and enjoy some cozy tea or hot chocolate after. Many wonderful cheeses may be found at Herma’s including Rozemarijn Lavendale which is a lavender gouda from Holland. We will be offering samples this Saturday and are excited to experience the interesting aroma that will be wafting from this unique cheese. At Herma’s we have an amazing line of exclusive Signature Products. One such product is our Cheddar Bacon Spread which may be used as a yummy spread for crackers. Keep in mind, however, that this is a versatile product and may be used in other ways. Try placing Herma’s Cheddar Bacon Spread on a twice-baked potato or in an omelette. Our theme this week is how to turn winter blues into winter-time fun. What could be more fun than creating the oozing, hot mixture that is fondue? We have all the cheeses that are traditionally used to create this decadent, timeless Swiss treat. Rub inside of a 4-quart heavy pot with cut sides of garlic, then discard garlic. Add wine to pot and bring just to a simmer over moderate heat. Then add cornstarch. Gradually add cheese to pot and cook, stirring constantly in a zigzag pattern (not a circular motion) to prevent cheese from balling up. Do this until cheese is just melted and creamy. Do not bring to a boil. Keep simmering 5-8 minutes until thickened, then transfer to fondue pot. Foods for dipping? Use Cubes of Baguette Bread – Roasted Potatoes – Broccoli Floret. The Swiss have it and so do we! Find Fondue Pots and Raclette Grills at Herma’s! 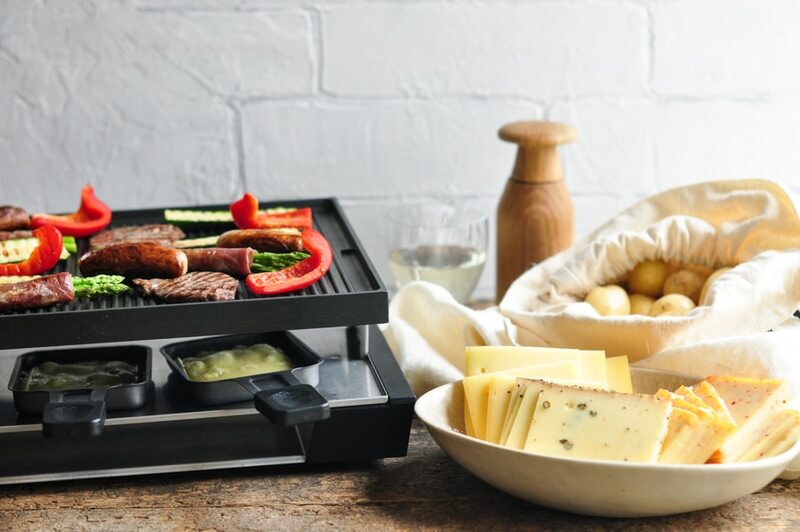 Raclette Grill 101 – Perfect Winter Meal with Friends! In Switzerland, enjoying a Raclette meal is something to be looked forward to when weather turns cold. It is a meal that is fun to share with friends as you enjoy cooking and preparing food together. The aroma of grilled food and the fresh, delicious foods combined with decadent melted cheese will have you enjoying winter in style. Prepare potatoes as desired. – Rub vegetables and meat with oil and season well. – Place 2 slices of cheese (Raclette, Gruyere or other similar melting cheese) into each coupelle (cheese pan). – Place sliced veggies/meat on table-top grill. – Cook veggies/meat and cheese at same time so they are ready together. – Pour cheese over potatoes and other foods. – Serve with other sides like gherkins and crusty bread. – Pair with a dry white wine. We wish you well as you try to stay warm and look forward to seeing you in coming days.